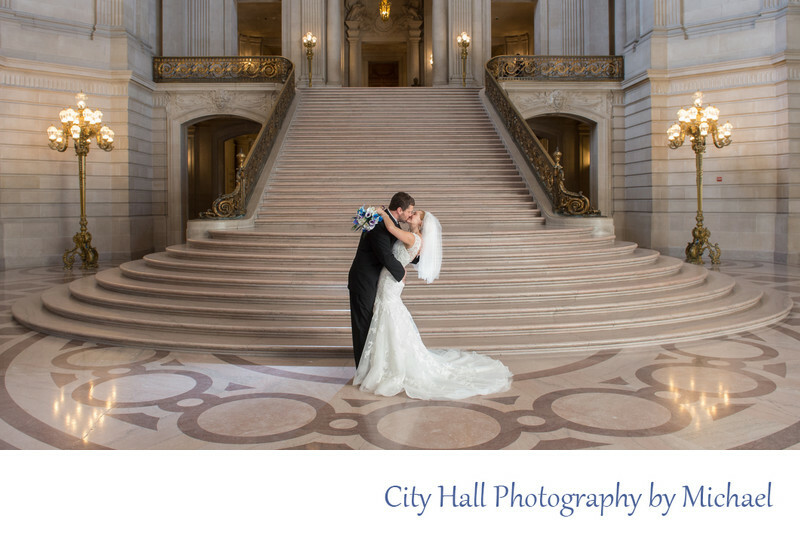 San Francisco city hall is famous for the Grand Staircase as a perfect place for wedding photography. In fact, its the perfect place for all types of portrait photography which is evidenced by the countless people that you can always see covering the Staircase. For this particular shot we posed the couple right in the middle of the stairs and positioned 2 professional lights on each side. We aimed one of them at the Bride's veil to highlight it and add some drama to the shot. In addition, we had the groom dip the bride slightly to add some motion to the image. I love the reflection of the lights on the floor beside the happy couple.